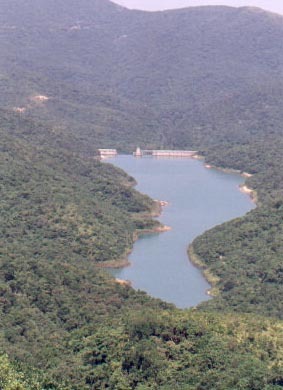 There are many streams coming from the Violet Hill(紫蘿蘭山) into Tai Tam Intermediate Reservoir. The representative of them are the streams No. 7 and No.11. 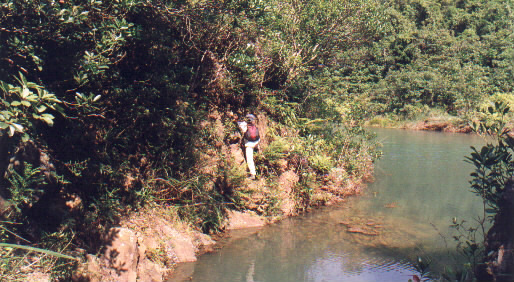 Both are good streams with a number of falls with clear water. We started our journey from Repulse Bay. By walking upwards along the road path, we noticed the hiking path on the left handed side of the Hong Kong International School. 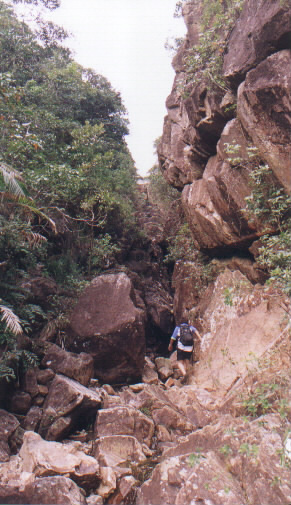 We trekked for a while before reaching Tsin Shui Wan Au. 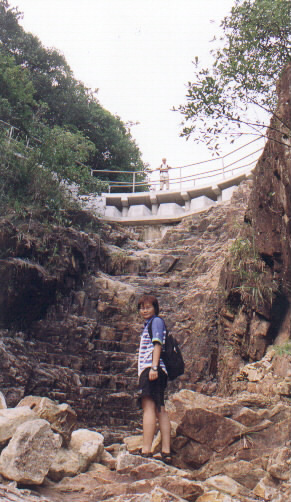 Tai Tam Intermediate Reservoir was under our eyes. 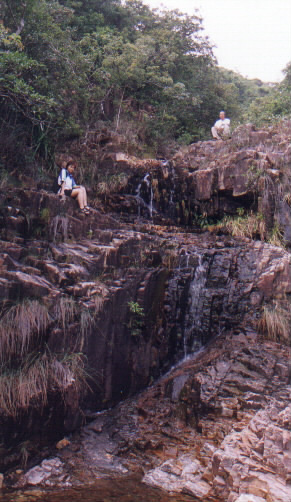 Following the catchwater, we met Tsz Tam Stream No.7 as shown on the map (at altitude 180m). Actually you can see the Number of "7" labeled on the rock. We went downstream in a leisure manner. We came across some moderate sized falls before reaching the lower end of the stream. 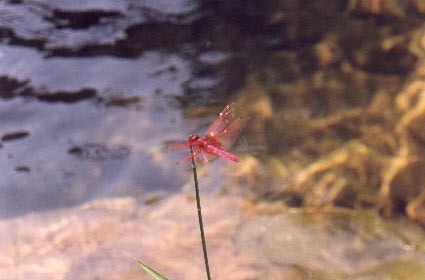 Here, there were beautiful Dragonflies in totally red-color! We faced the reservoir and wondered how to go to Stream No.9 on the left-handed side. 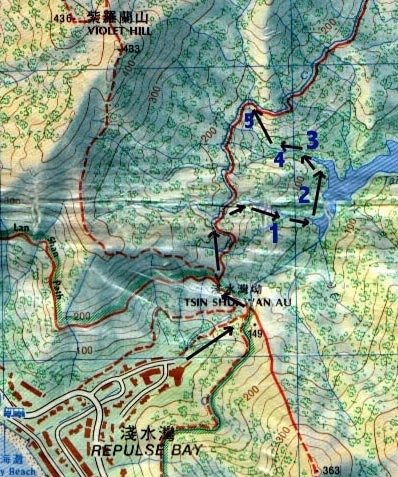 Saichit went across the rocks along the border of the reservoir and detected a hidden walking path very soon. That path is easily to be missed. Be careful when you trek along the border of the reservoir. You may step on nothing and fall into the reservoir! 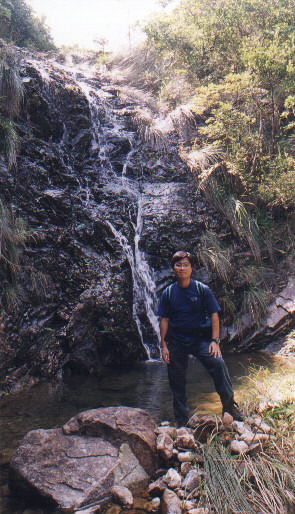 After about 20 minutes of "jungle walk", we arrived at the lower end of Tsz Tam Stream (Altitude 60m). I was surprised that there was a great falls situated there. 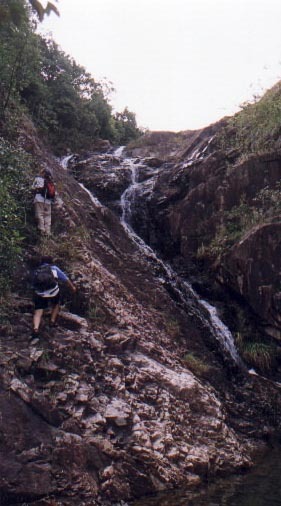 It is a falls about 50 feet high. There is also a pool under the falls, which is big enough for a swim. 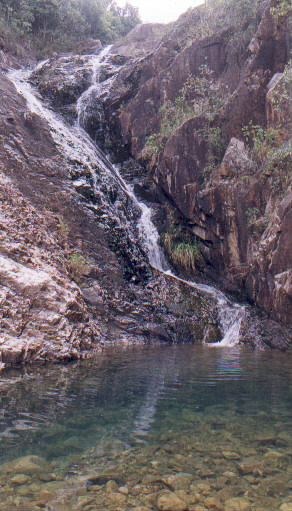 There are few great falls seen in Hong Kong Island- this is one! We climbed on the left handed side of this great falls to reach its top. 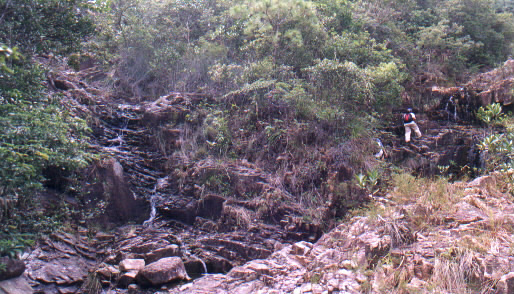 Very soon, another rocky falls was waiting for us at the altitude of 80m. We simply climbed it up. At altitude 95m, there was a big branch of the stream. Staying on the right hand side, we met another falls and took a rest. After passing the above scenery, there was another falls (about 20 feet high) coming. (Unfortunately, no photo was taken for that falls). Be very careful when you climb up this falls on the left handed side. 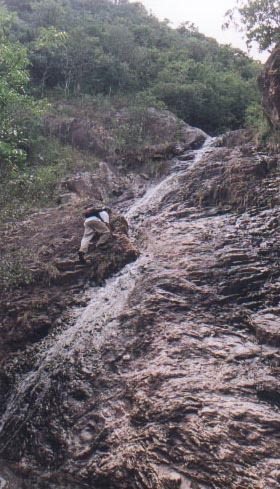 The rocks are quite steep and very slippery. You have to grasp the rocks firmly and had a good balance of your body. Otherwise, you must be broken if you fell down this falls. At about 150m high , we passed through a narrow valley. Before reaching the well established hiking path (the end of the stream trip) at altitude 160m. Thanks to God that I did not fall down the slippery falls!